← Earl Grey Chocolate Torte Because England! 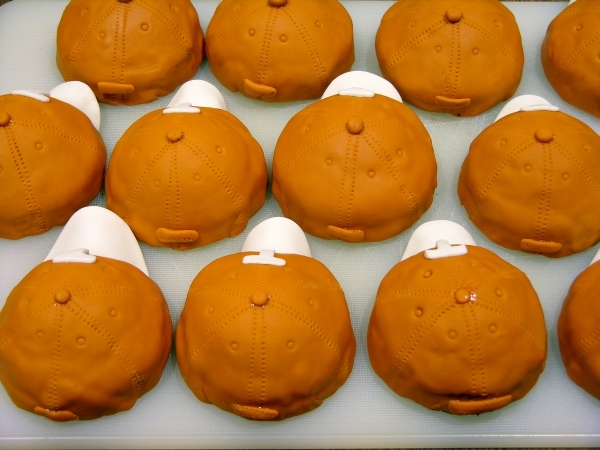 Delicious, adorable little baseball hats with a candy surprise inside. Your team/party/afternoon needs these! The hats from the back. Imagine this display coming out for your next sports-themed event! Early in the summer I purchased the Nordic Ware Cookie Cups pan (note that this is different than their cake ball pans!) because I’ve been experimenting with 3D cookies and thought this pan might help. It took a bit of getting used to – especially remembering to liberally spray oil on the plastic press part, including a fresh coat for every new pressing – but the pan works to make vaguely spherical cookies. I say “vaguely” because each half-sphere tends to have a bulge in one side and when two are put together, they’re a bit short to make a fully rounded sphere. I have made spherical cookies in the past using half-sphere pans with the cookie dough on the concave side (and only just noticed that I never finished the post about those, whoops, heh, sorry), but the dough there rises up in the middle so you don’t get a lot of interior room. This Nordic Ware pan uses the convex side so your cookies have really nice hollow middles, but the tradeoff is the outer surface isn’t as smooth. Of course, if you’re going to cover the outside with some kind of icing anyway, it doesn’t matter if the cookie surface is a bit crackly. And if you stick to shapes that are okay to be slightly less than spherical, the pan works really well. In linking above I see they are now showing a methodology where you put balls of dough and press down, but everything I made here used the methodology recommended on the label, which was to roll out a sheet of dough (I used my favourite dark chocolate rolled cookie dough), place a sheet over the pan, tuck the sheet down into the indentations between sphere bumps, press and cut with the plastic press, and then remove the excess. I brought the pan with me here to the UK for more playing around, so I’ll try the dough ball method soon. 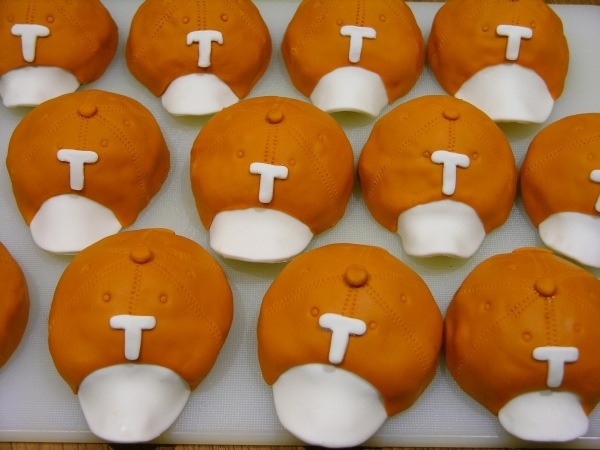 When Capital Confectioners was having a summer-themed bake sale, I made these baseball hats in the team colours of the University of Texas in hopes of raising money for the club. You can make any team colours that suit your needs, and if you’re feeling very fancy you could even make or edible-image-print some team logos! 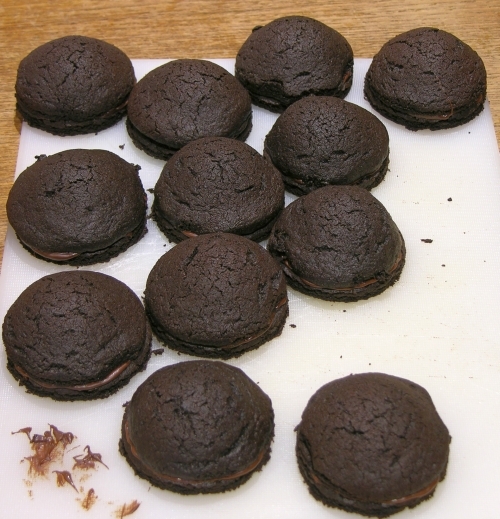 First I baked a bunch of half-spheres with the Nordic Ware pan and let them cool fully. Then I baked a batch of simple round cookies, using a round cutter sized to the actual half-sphere bottom edges so it’d match as closely as possible. I have a set of Ateco round cutters so I have a lot of choice in size; if you don’t, pick the closest round cutter you have that is slightly larger. You can always trim if necessary, but if you go too small, your bases won’t fit your cups. Once both the cups and rounds were baked and cooled, I melted a bit of semi-sweet chocolate and put it in a small piping bag (a Ziplock bag with one corner cut off will do just fine). I placed some M&Ms (these happen to be the dark chocolate kind but any small candy will do) in the cups and then piped some melted chocolate around the edge. You can see that the cups do not all come out evenly round on the edges, so attaching can be difficult where edges are thinner. Always place the candy in first and then pipe the chocolate second, or else the candy will land on the chocolate as you put it in and then you totally have to eat any that stick and get in your way. I mean that’s probably a law or something. And if you do that too often you won’t have any left to fill your cookies. Yes. 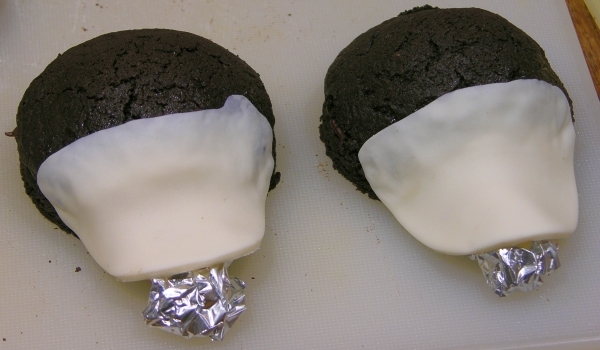 I then put the round cookie bases on the candy-filled cups like a lid and balanced them so the chocolate would harden in this upside-down position. That helped prevent candy and chocolate from spilling everywhere because, as mentioned in the caption above, you’d have to eat it all to hide the evidence of your mess. The instructions above can be used for any kind of design, and in fact I’ve already made more for various holidays and other themes that I’ll post soon (Update: here are some made to look like Jack-O-Lanterns and a slight variant for choco-blood filled eyeballs). 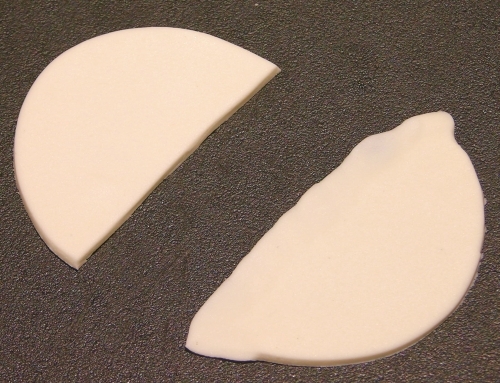 For the hats, make a brim by rolling out some white fondant (or your colour choice) fairly thin and cut an oval. Again, I have Ateco’s graduated oval cutters but if you don’t, you can use a circle cutter or do it by hand. Flaring the edge will help you squish it onto the ball, making it stay on better. Plus it prevents the next layer from having a discernable lump from an edge underneath. Since you’re cutting two brims at a time, brush two cookies and then apply the brims. There’s not much point in brushing the corn syrup on a bunch of cookies in advance, as it seeps in and/or evaporates after a few minutes. Note that the brims don’t have to be perfect or all match; many baseball hat wearers bend their brims to suit their own preferences. Roll out some fondant very thinly in the colour needed for the main part of the hat. 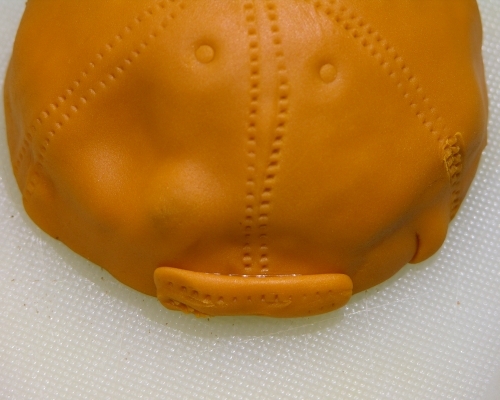 In this case, I made some burnt orange by adding a bit of Americolor Warm Brown gel to some Satin Ice orange fondant. Cut a circle using a cutter a little bit bigger than the one you used for the round cookie bases; remember that you’re working in three dimensions so you need more fondant to cover the cup cookie and the base all the way down to the bottom. Better to go a bit big and trim off than have to stretch it and risk tearing. The indentation will accommodate the brim. Brush the cookie and the part of the brim attached to the cookie with your corn syrup mixture. 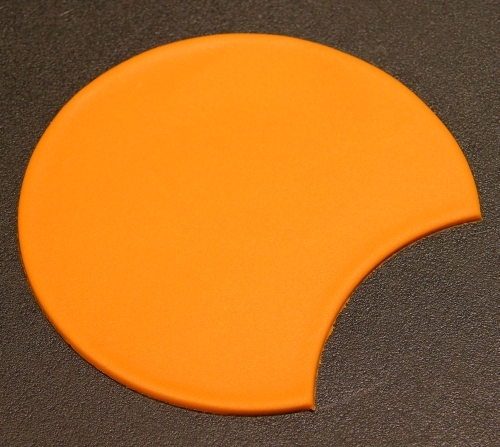 Lay the fondant over the cookie so it is centered and the indentation is centered over the back edge of the brim. Put it on gently at first so you can adjust it as necessary, and then smooth it on with your hands from the center top down to the bottom edges. Because this is fabric, you don’t have to worry about it being perfectly smooth! You just want to make sure it’s firmly on the cookie with no air bubbles so it doesn’t crack later. Trim any excess at the bottom with a sharp knife, cutting inwards against the base so it tucks the “fabric” underneath instead of leaving any exposed cookie showing. Make seam lines with a stitch wheel (also known as a pounce wheel), or if you don’t have one, the end of a tooth pick dotted along. Make the first seam line going up from the center of the brim, over the top, and down to the back edge. Then make another one alongside it. Next, start at the center top and make a stitch lined down to the bottom edge at about a 60 degree angle (roughly a third of one side). Then start alongside that one at the bottom edge and go up in parallel over the center top and down a matching angle to the other side. Then make the second part to that first 60 degree angle line. Then make the next lines at 60 degrees from the other side of that center line. See the photo below for reference. Use a small round tool (I used the tips of a plastic piping bottle, but a #3 or similar size regular piping tip would do, or a clean condiment squeeze bottle top) to make a little round indentation between each stitched angle as shown below. 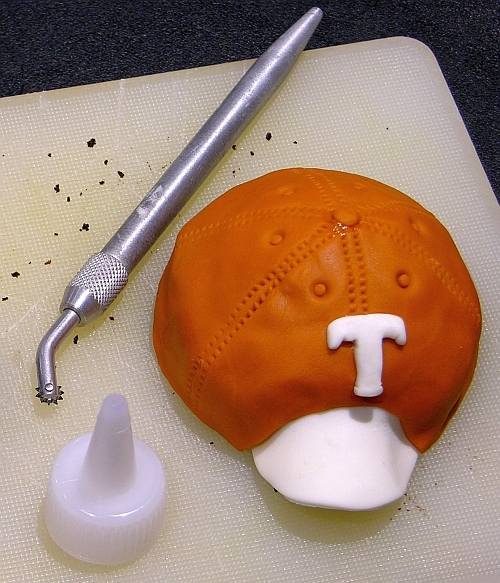 Make a tiny dot of fondant and use a bit of water to affix it to the top cross point on the cap, as shown in the photo. This may match or be a different colour depending on your cap’s style. Do a Google Image Search for your team’s hats to check. For these hats, I used a Wilton alphabet T cutter to make little Ts in thinly rolled white fondant and affixed them on the middle with a bit of water. You can put any design on that suits your needs. If you don’t have a stitch wheel, I recommend getting one. Mine is metal from an art supply store, purchased decades ago. These days inexpensive plastic ones are readily available from any cake decorating supply shop. It’s a handy way to add a fabric look to stuffed animals, clothing, and more, and so much faster and easier than poking with a toothpick. A little band adds that extra touch of realism. I guarantee you, nobody will notice that little pleat of excess fondant on the right side, because it just looks like fabric and also it’s a candy-filled 3D adorable hat cookie. Then sit back and await the joy that comes from the recipient breaking or biting the cookie open to find a candy surprise inside! It’s a cookie. It’s a hat. 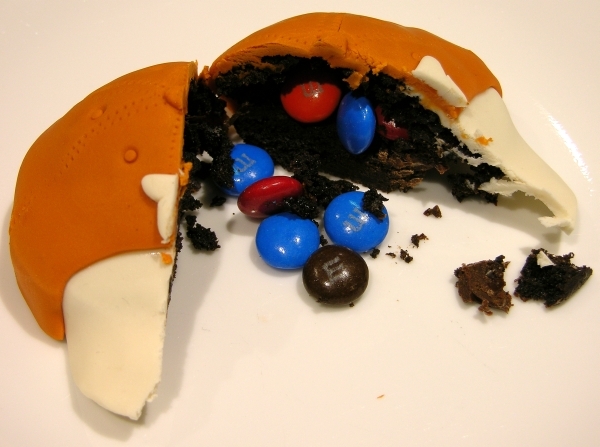 It has M&Ms inside. It’s chocolate containing chocolate. It is made of happiness. Watch out for more styles coming soon! Hint: Halloween is coming up and I know how to make things bleed chocolate. Muahahahaha. Sign up for automatic updates from this blog using the Subscribe function in the upper right of each page to make sure you don’t miss anything! This entry was posted in 3D Cookies, Cake Decorating, Cookies, Experimental Techniques, General Freakishness, Products. Bookmark the permalink.